Why would anyone drag a PA system powered by car batteries, loudspeakers, recording equipment and musical instruments to a mountain in the Himalayas to produce a natural echo ? I remember echoes in the mountains from my childhood in Switzerland. There was something magical about those sounds and the fact that the mountains answer to calls and not only send them back but add their own voice. I want to use that voice as a musical instrument. Not just as effect or enhancement but as an actual instrument that is part of a larger musical composition. The sitar with its unique sound and the modal structure of Indian Music with its natural scales combine perfectly with natural echoes. I have often been asked why I don't produce these effects in the comfort of a studio . The answer is that no digital effects processor can simulate the acoustics of real mountains. The processing power needed would be astronomical. I want the real , raw thing, not a simulation but the infinitely complex patterns produced by rock faces towering thousands of feet into the sky. The beginnings of this project go back to 1990 when I as living in McLeod Ganj, Dharamsala, India.Dharamsala lies at the foot of the magnificent 17'000 ft Dhauladhar Range and is famous as the home of the Dalai Lama and the headquarters of the Tibetan community in exile. I first came to Dharamsala in 1978 as a student , rented a house from the famous painter Alfred Hallett and spent time there whenever I could. In 1986 after the death of my great sitar hero Pandit Nikhil Banerjee I moved there permanently and worked for the Tibetan Institute od Performing Arts. A first expedition was started in December 1990 with the help of my friends Christina Lundberg and John Vincent Bellezza. We had very limited equipment but were lucky with the weather and the results were spectacular. Three more followed , two were successful and one was aborted because of bad weather and lack of funds. From the beginning it was my intention to not just produce ambient echoes but precisely defined echo patterns that could be used as actual elements of composition. This requires single echoes. Multiples , while creating a beautiful effects, are not suited for this purpose. Moreover , playing fast runs and incorporating rhythm instruments such as tablas is impossible with multiple echoes . That is why I had to restrict myself to slow playing, a style that is called alaap in Indian Music. Triund above Dharamsala is spectacular but I feel I have now exhausted the possibilities the place has to offer. 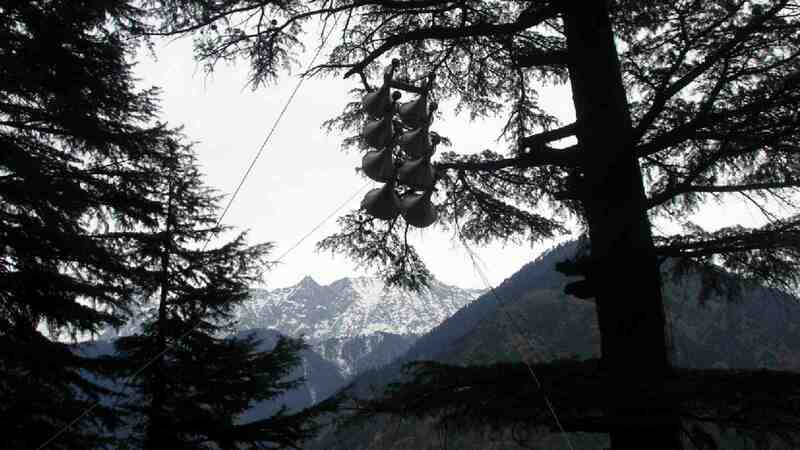 It is not above the tree line and it is subject to severe monsoon climate which makes the weather unpredictable. Weather plays a crucial part . Damp and fog or clouds kill the sound. I experienced this several times when clouds drifted in, the sound would simply disappear and return as soon as the clouds had moved on. With the effort and the expense that goes into an expedition of this kind I cannot afford to be at the mercy of unpredictable weather patterns. The next step is therefore an expedition to Ladakh or Lahul Spiti. 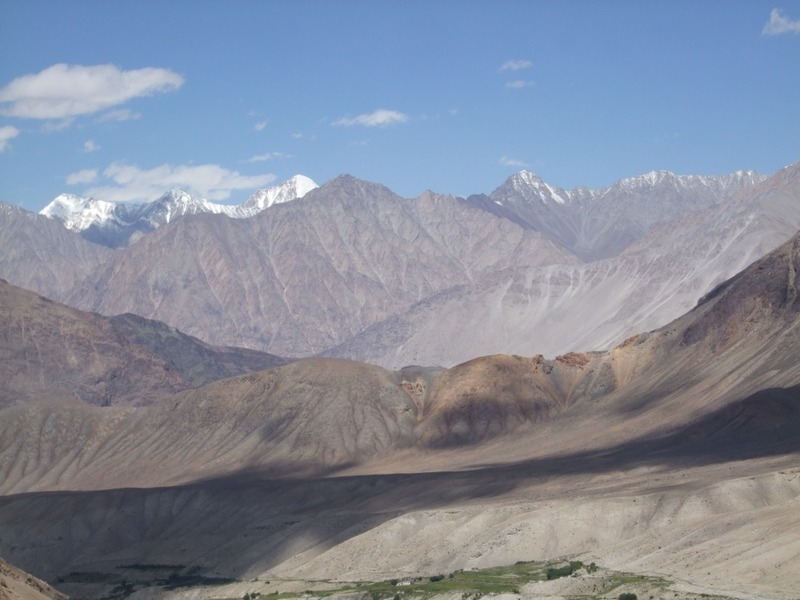 I went exploring in Ladakh and I have several places in mind that look just right. 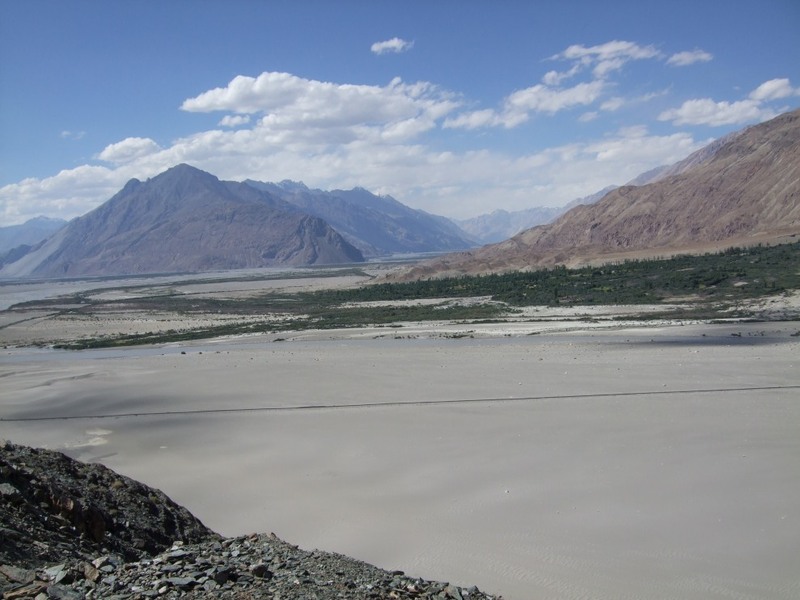 Ladakh has no monsoon climate, very little vegetation , few running rivers that produce background noise and it is generally very dry. An altitude between 15 and 18'000 ft would be ideal.There are huge rock faces that will return the kind of echoes I want. And more power and lots of it. On the first expedition I had about 200 Watts, on the second about 300 and on the last venture in 2008 about 700 Watts. I had great hopes for the 700 W setup but the laws of physics dictate that for twice the perceived loudness about ten times the power is needed. We are dealing with acoustics on the largest imaginable scale here. 700 Watts against those huge mountains is a drop in the bucket. As soon as I can move into the 5 to 10 KW range I will get the results I want. There also is a problem with the loudspeakers . The horn speakers I have been using so far while being very light, efficient and reasonably directional have a very limited frequency and dynamic range. The kind of speakers I need are not commercially available so I will build them myself. I am looking forward to building at least 4 huge 'sonic guns' that will do exactly what is needed. Apart from breaking new ground in acoustics I would like this project to benefit the local inhabitants of the high Himalayan regions. The effects of climate change are serious and have a negative impact on the already fragile ecology. Himalaya expert Rahul Ogra sent me a video clip on this topic, it is on my Youtube channel and on the video page on this site .If the next expedition produces a commercially marketable recording or documentary I will contribute a percentage of the proceeds to a NGO or charity that works to mitigate the effects of climate change, ideally in the area where the recording takes place. By downloading the audio track or the video on this site or by supporting this project with a donation you will help to make that possible. Corporate sponsors and enquries from film, television and music producers are welcome. 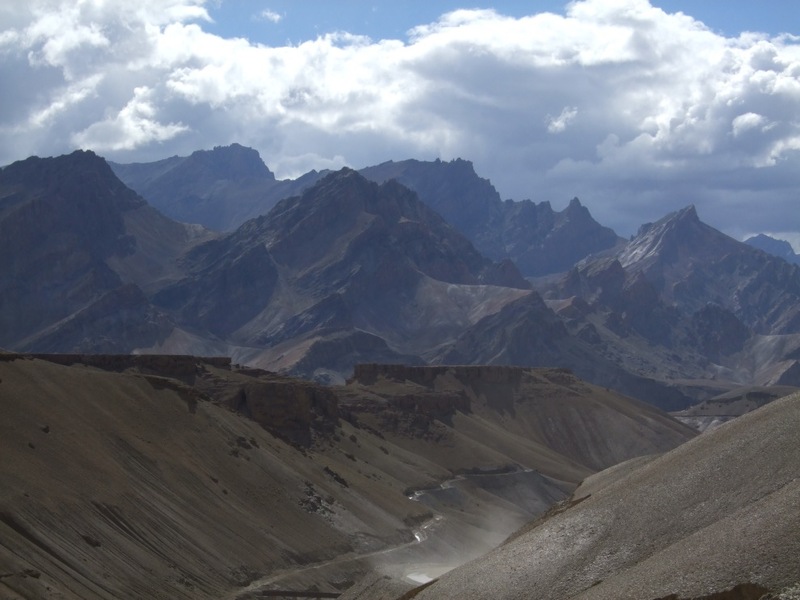 Below are some pictures from Ladakh, taken during an exploratory trip by motorcycle in 2008. These are the kind of rock faces I intend to use.